Not only my makeup changes with the seasons, but also my preferred nail polish shades. As trends change and as my tastes changes, so do my favorite nail polish shades. Since I last did a fall nail polish favorites 3 years ago, things have definitely changed. Not a single of the polishes that made the cut then, made it now and some have since been decluttered. Here are my 6 fall time favorite nail polish shades. You will notice however that brand wise I haven’t strayed from my usual favorites. OPI, Essie, Catrice and Barry M are some of my longstanding favorite nail polish brands. The Revlon polish is the odd one out here, but one I bust out every fall. 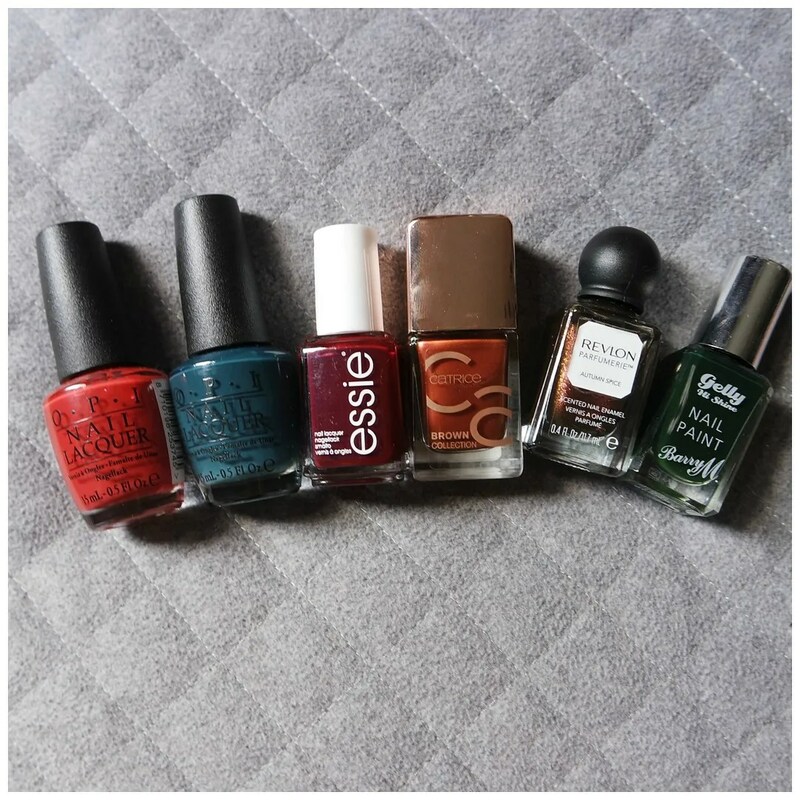 The shade range is perfect for all: dark reds, teals, bronzes and other rich jewel tones are my favorites on my nails as well as on the rest of me come fall time. OPI CIA = Color is Awesome – Teal is one of my favorite shades in the fall time, it just isn’t around much. Not in fashion, not in makeup and hardly in nail polish. So when I spotted this as part of the Limited Edition Kerry Washington collection, I snatched it up straight away. Essie Bordeaux – My love for Essie is a little more recent than OPI, but it has quickly become a favorite. Bordeaux looks great in the bottle, but the first layer of this is so disappointing. This looks so sheer at first. Luckily, two coats make it opaque and this polish does what it says on the tin: it’s a bordeaux nail polish shade. Catrice The Brown Collection Goddess of Bronze – For fall/ winter 2017, Catrice released some new nail polish lines. The more unique of the two is definitely The Brown collection with some stunning brown based nail polishes. I’m a sucker for metallic nails in the fall time and this looks stunning on the nail to boot. Revlon Parfumerie Autumn Spice – This polish makes the rounds every year at least once. I’m not too keen on the smell: the whole point of this line was that all the polishes had a scent that was linked to the color. The scent is quite strong the first day, but it wears off quickly. Shade wise it’s just a dark brown with lots of fine specks of gold that just make this the most perfect fall shade. It’s the color of turning leaves in a nail polish. Barry M Gelly Nail Paint Black Pistachio – A bit of an odd one out maybe, but Black Pistachio by Barry M is a very deep dark forest green and I love for shades like this in the fall. It is dark, it is rich and it works well with many of the dresses I like to wear in the fall time. Deep jewel tones all the way! What nail polish shades do you like to wear in the fall time? How many nailpolishes do you have? Thanks! You just can’t beat those colors for fall. Lovely colours. I rarely wear nail polish. I find it chips after 1 day, even using base coat and top coat. Any advice on how to make it last would be most welcome. A lot of time and patience taking care of my nails. I use a nail restorer and nail hardener on my nails by Trind. That really helped improve my nails and prevented chipping. Got to declutter my polish. We have a big basket full & probably only use 5-6 regularly. I would love to buy some more muted earthy shades, but I feel like I can’t cause the basket’ s full 😂 time to declutter & restock! Just a basket? My nail polish is housed in an Ikea Helmer!